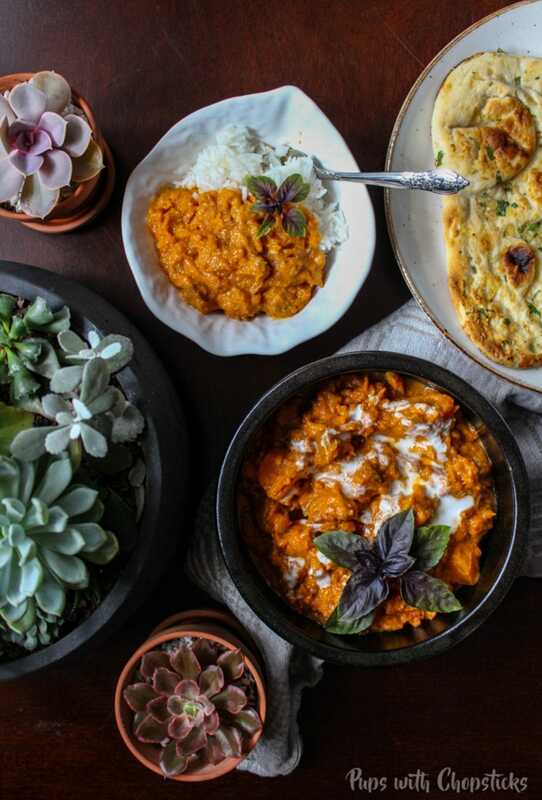 This easy one pot butternut squash curry is perfect for a lazy day where you don’t want to babysit the stove, but you still want that ‘extra something’ for dinner. The sweetness from the squash pairs up amazingly with the creamy coconut, and did I mention? It’s a great way to use up leftover meat! As a kid, curry was never a very popular dish in our household. My first experience with curry was when my parents took me to a Hong Kong style cafe restaurant. I remember it being very saucy, usually bland, almost always with chicken. This was great because I had something to mix with my plain white rice – which I hated, but curry was still a meh kinda thing for me. Then I moved out on my own to Waterloo, and this was when I was exposed to North Indian/Pakastani curries — the raddas, the acharis, the saags and the karahis. Curry was never the same to me after that experience and embarrassingly, it had also made me a bit of a curry snob. 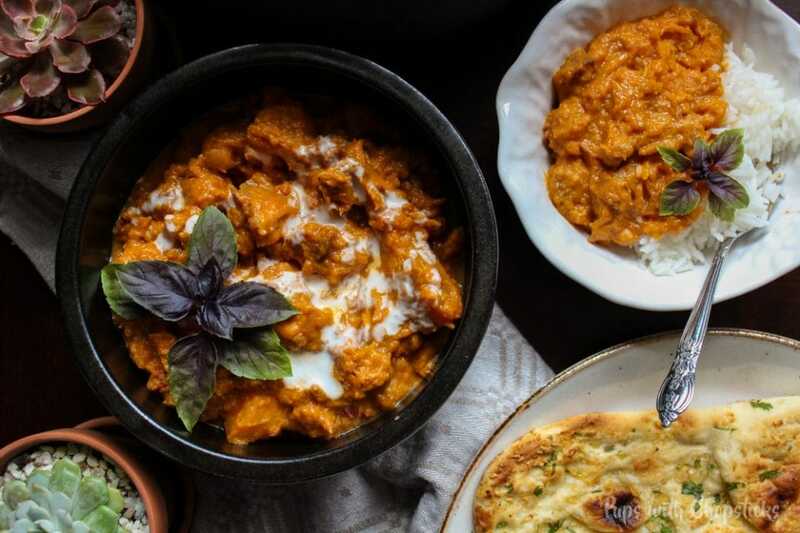 Nowadays, I only get my curry from this little hidden gem, and even though I tried (over and over and over again) I could never (ever) recreate the flavours, …that is until now! 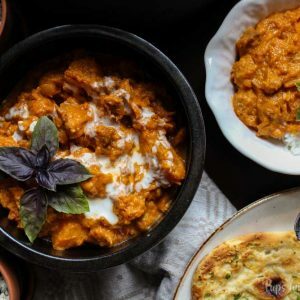 For this butternut squash curry recipe, most ingredients can be found at your local grocery store. When you brown the the curry powder, curry paste with the onion, garlic and ham you might notice that a lot of the bits will stick to the bottom of the pan and slightly burn and turn brown. Don’t panic! This is flavour! 🙂 Once the squash starts to cook and soften, it will releases liquids – use the liquid to scrape the bottom of the pan. The burnt will give the curry a nutty flavour. Creaminess Comes from the Butternut Squash! Before you add the butternut squash, the curry will look very dry after you put all the ingredients into the pot. Don’t fret — the squash will save the day. Squash has a lot of water in it. As it starts to cook down, it releases a lot of liquids which creates that saucy creaminess in this dish. After this meal, I learned that good curry doesn’t have to have 500 spices and to have faith that sometimes food and random ingredients you’re not familiar can surprise you sometimes! 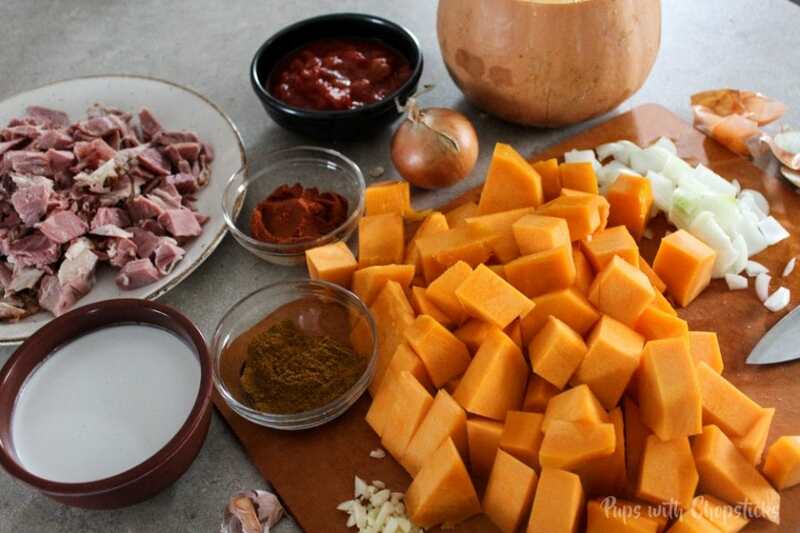 A quick and easy one pot butternut squash curry made with coconut milk, squash and ham. 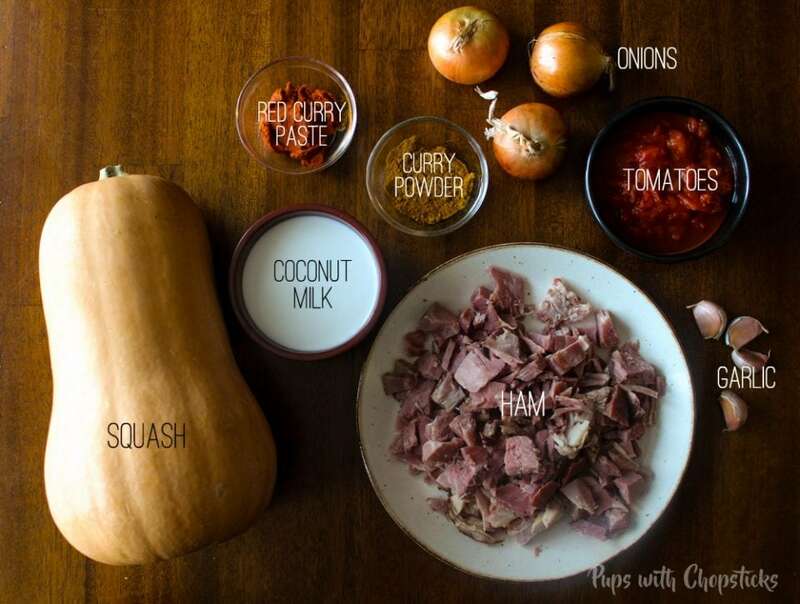 Great recipe to use for any types of leftover meats. Adjust the stove back to low to simmer for 60 mins and check every 15-20 mins to stir it. To easily cut squash, poke multiple holes in it and put it in the microwave for 3-5 mins. This softens this up so it can be easily chopped. Be careful! The squash is VERY hot once it’s been microwaved. During the cooking process, it may look very dry. Don’t worry, the squash will release it’s liquids once it has been soften. If you add water, it will make it too runny. Trust the squash! 🙂 If it’s too dry for you even after the squash has been soften and fully cooked, you can add a bit of chicken stock. Squash and coconut seem to be the perfect combo! Should give it a try as I’m sure it’s delicious! What a delicious combination! Love how creamy the squash gets. Me too! 🙂 I was quite surprised how well the squash made the texture of the curry! This looks delicious and unique, I have never tried ham in curry before. I love the flavor of curry and so does my family so we are always looking for new ways to use it. I love this idea and maybe I could even get my kids to eat squash this way! I like the combination of squash with coconut. A lot of flavor with just a few ingredients. I think I will try this with some legumes or chicken as I don’t eat ham.